We like strong, masculine dog names for our male pets, and frilly old-lady girly names for the females. If we were starting from scratch with him as a puppy he would have to be named Braveheart, as it characterizes his personality to the utmost. Six-pound Roscoe is definitely the Alpha Male in our household of 3 pets; the 20# Maine Coone and 20# PeekAPoo are intimidated by him. Roscoe especially protects anyone who is "down" or ill and is a force to be reckoned with, even if you are a fuzzy white bear that looks too much like he does! He started out with a young couple in California who travelled alot; having the dog was a problem for them and so they handed him off to a groomer in our neighborhood (how did he get to Wisconsin?) ... who often shelters animals; she enlisted our neighbor to add him to her household and it was there my hubby met and fell in love with him. When our neighbor's health was declining she asked if we would take him if she could no longer care for him, since he obviously loved us. We said "certainly" ... as she was entering the hospital / hospice for her final stay he came to us just before Christmas 2008; his former owner passed away a little more than a year later and often checked with us by phone to make sure we were still loving him as part of our family. As much of a challenge as he sometimes is, due to having had tough times with other animals and being left alone most of the day while the prior owner was hospitalized (having to compete for food and attention and missing his person) I've pledged that he has a home for life with us. I look forward to adding a female puppy to our family at some future time because I thoroughly love the breed characteristics and want to have the opportunity to train and bond with a little girl of my own, since Roscoe is "daddy's". What a darling--he does look like a Rascal though! Tell us why Braveheart suits him better. 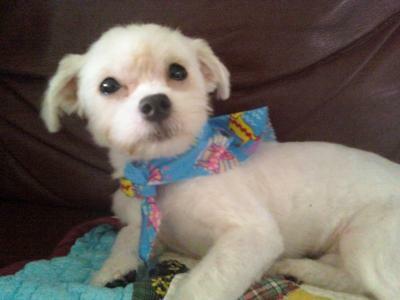 And why did this adorable dog have to go through four families to find a loving home like yours? I've always given my babies "unusual" names. 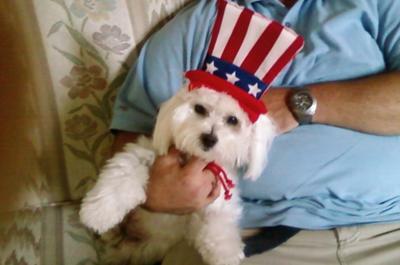 I've had Rupert, Buford, Earl, Gladys... as well as more traditionally named furkids like my all-time sweet boy, Charlie the Maltese. He joined Major, Daisy, Abby and Buttercup. 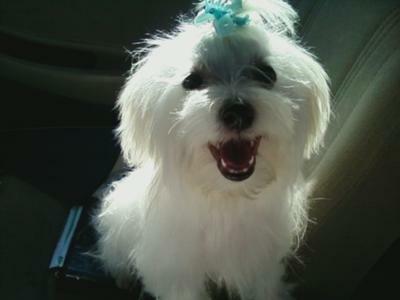 When I was given the opportunity to adopt an 8-week-old Maltese (my favorite breed, by far! ), I chose FLOYD! Don't ask me why... but I am reminded of Floyd the Barber on The Andy Griffith Show. He was a funny, gentle and kind man. And I just like the comical sound. I think it is a great dog name for males. I know that Floyd will be a lifelong companion... as was Charlie who passed away in November of 2010, at age 20!! Kisses to all the Maltese babies out there. Cute name....and I'm sure you will be very happy together! I was going to name my Maltese Tiger Lilly but the morning after I brought him home, he woke up with his hair looking so disheveled that I decided to name him Scruffy. Now I call him Scruffyliscious, Scruffyboo, Scrufflylove and other Scruffy derivatives. Dear Scruffy, Hi! This is LuLu and LoLLy, we are 2 Maltese dogs! WOW! Look at all that hair, we need a haircut too. Two Paws UP! for your outstanding pikture! Teddy is a rescue dog and his name was Bear. I wanted something to not remind him of his past. He was kept in a kennel 24/7 and he had to stand and lay in his own urine and feces. He reminded me of a Teddy Bear. I make sure no one calls him Bear. I have had Teddy for about 10 months and he has come a long way in a short time. He was afraid of grass, men and everything. He loves to walk in grass now. He is a treasure and I am blessed to have him. I do not crate him at all because of his past. 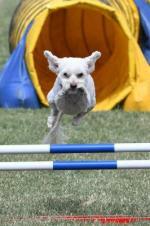 Your story really touched my heart as we rescued a teacup poodle just over 2 years ago. When we took him for his first visit to the Vet Clinic, we were told he was not 14 months old as the mean lady had told us. He was about 8-9 years old. His teeth were rotting, he had infection in his eyes, ears, and mouth. He had "Cage Craze" where he runs in circles as a result of being caged up. His front paws are crooked from what we think were injuries from the wire crate, and not being taken care of at the time. His name was "Sammy" when we got him, and we couldn't bear to keep that name, but were worried he wouldn't adjust to a new name. However, our daughter named him Bentlee Samuel, and it's worked out great. We don't call him "Sammy" or mention "The Farm" where he came from because we too don't want him to remember his terrible past. He now has a great wardrobe, warm cozy beds, and a loving family. We're so glad to know that you took Teddy in and have given him a better place to live. THANK YOU FOR GIVING THIS PET A GOOD AND LOVING HOME. THE WONDERFUL PEOPLE OF THE WORLD WHO TAKE IN DOGS FROM SHELTERS ARE ANGELS. BEST WISHES TO YOU AND TEDDY! We got him on Ringo Starr's birthday - July 7, 2007. 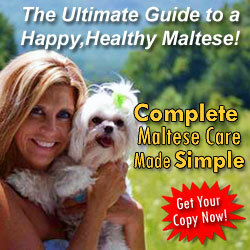 We think it is a very cute male dog name for a Maltese. 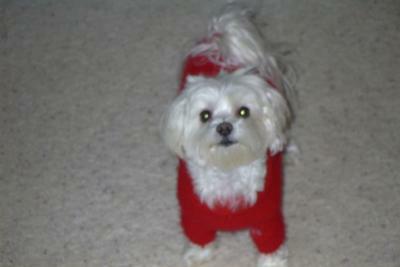 Our two Maltese puppies Ace and Rocky were 4 months old when we got them. We wanted to give them Masculine dog names. Ace was already named and we loved that name so we kept it. Rocky was named too but his name was originally Binx and that was not a good name for him at all. So we went with Rocky because of his personality. He thinks he is the biggest dog in the world but he is actually smaller than Ace and my Cockapoo Toby. They are our babies. My sweet, 4.5 pounder is quite tiny. I have always been a fan of the ironic dog names, So I was going to name him something like "Giant" or "Monster". Giant brought up André The Giant (from The Princess Bride) so it was perfect! That's what happens when you let your grandchildren name your dog! Elmo is actually an Italian dog name. I looked it up and in Italian it means "worthy of love" which is perfect. Elmo is a rescue and I'm so happy to have him. 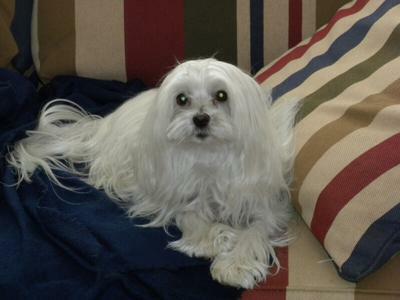 My other Maltese, Rudy, gets along fine with him and they play like puppies. 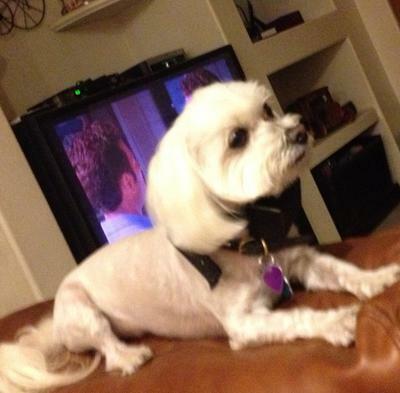 Out of all the six Maltese that I've owned over the last 23 years he's the nicest looking. His hair is long because he let's me groom him and even likes the attention and sits still while I comb him out a few times a week. 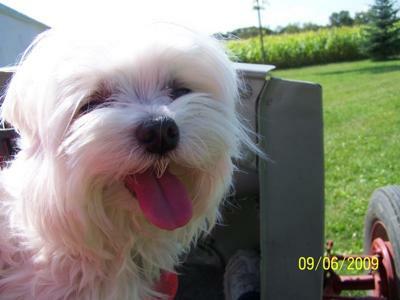 Elmo has to be the prettiest Maltese I've seen! 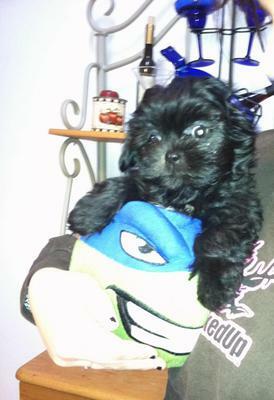 Little Miss Muffit is a Maltese/Yorkie cross..a Morkie. 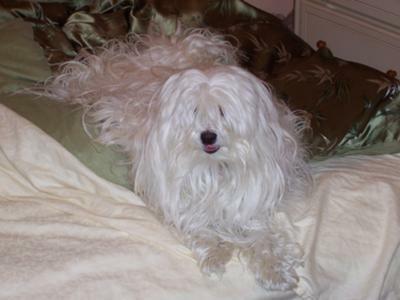 She's very light, almost white, with golden overtones which is very pretty. She's almost 5 mos. old, and I hope she will be as beautiful as Elmo. How old is Elmo? and is he good with other dogs? How about size, is he less than 8 lbs? 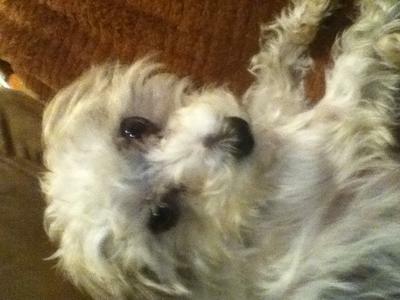 I chose Eli because he was a sweet frisky little dog so he got a little name. He is also named after the dog we had that we loved so much, Ellie. He liked it and we liked it so it stuck. We found the perfect masculine dog name for our Maltese. My husband is in the Army and we are living on an Army post. He didn't want to be seen walking a small white fluffy cute dog when all the other soldiers have large guard dogs so he said if we we're going to buy a Maltese he had to have a manly name and be as masculine as possible. So we named him Bruiser and he wears a spiked collar and has a mohawk. We dye his hair all different colors. Right now his mohawk is red for Valentines day! My husband still jokes that we should have gotten a huge dog, but I know he secretly loves cuddling with our little fluff ball! 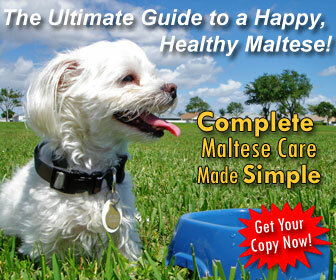 Men all think they need a big Rotweiller or Dobie or Pitbull, but these little Maltese and the mixed little dogs can win over a man because they are so brave for their size, and have big attitudes! My husband has fallen for Muffit, too. 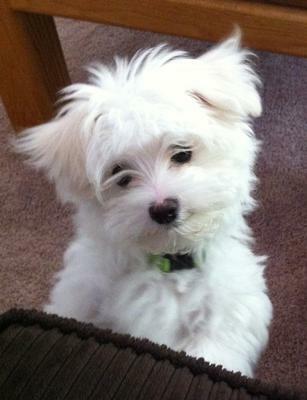 She's a Maltese/Yorkie mix and incredibly cute, too! 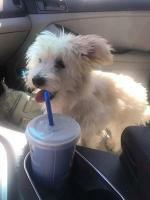 We have a Maltese mixed breed Cocker named Buddy, we wanted a quick, easy to remember dog name so my son came up with Buddy Jr, my husband then said "BJ" it sounded like a spunky name, once we saw our BJ and how love-able and his spunky personality and high energy, we said, that's him & that for sure is his name! So BJ stuck! I am a minister. The house of Levi were one of the tribes of Israel, and the one where the priestly role basically came from. I had decided to think about the name and took him to church with me that night. The person who read the devotion at the meeting then read the passage about Moses in the Bulrushes, which starts out by saying that Moses came from the tribe of Levi. At that point, it seemed like a sign! What better name for a little boy with a BIG attitude!?! We wanted a very masculine dog name. Everyone expects a large breed dog to be named 'Diesel'... not a cute little fluffball! My Mal-Shi is black with white on his chest just like my black onyx ring with a diamond in the middle. He looks like a stuff animal. 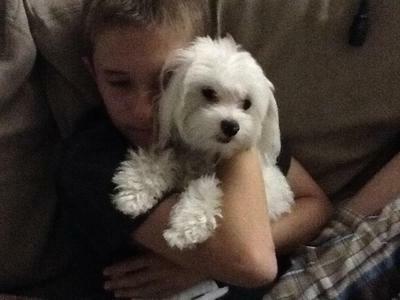 My son, who was 11 years old at the time (now 14) named Stewie after the character in the Family Guy cartoon. Our family absolutely adores our little boy, Stewie! I'm a golfer and Divot looked like a perfect hairy divot when he was a puppy.